Inside the Arte Antica building, SPAZIO NOVECENTO means 1000 mq of versatility and elegance right in the heart of the historical EUR, two steps away from the city centre and well-connected with the “Grande Raccordo Anulare” and the Fiumicino Airport (FCO). A scenographic terrace makes the location perfect to welcome events all-year-round. Spazio Novecento is ready to host: conferences, meetings, private events, exhibitions, fairs, gala dinners, fashion shows etc. The project SPAZIO NOVECENTO is based on a very innovative concept for Rome: a location for events with a major component: versatility and adaptation for any special need or request. Its technological equipment is well comparable to a real TV Studio making it possible any kind of customization and personalization thanks to our dedicated staff. Spazio Novecento is the perfect location in Rome for your events. Spazio Novecento is located inside the “Palazzo dell’Arte” which ia an historical building developed more than 70 years ago inside the “Esposizione Universale di Roma (Expo)” project. 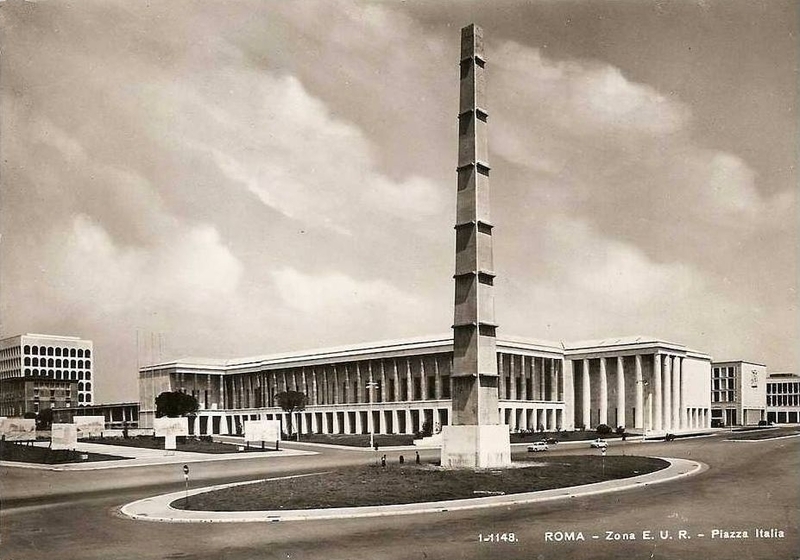 In the 1935, XIII from the Fascist Era, the governor of Rome, Giuseppe Bottai, proposed to Mussolini the nomination for the “Esposizione Universale“. 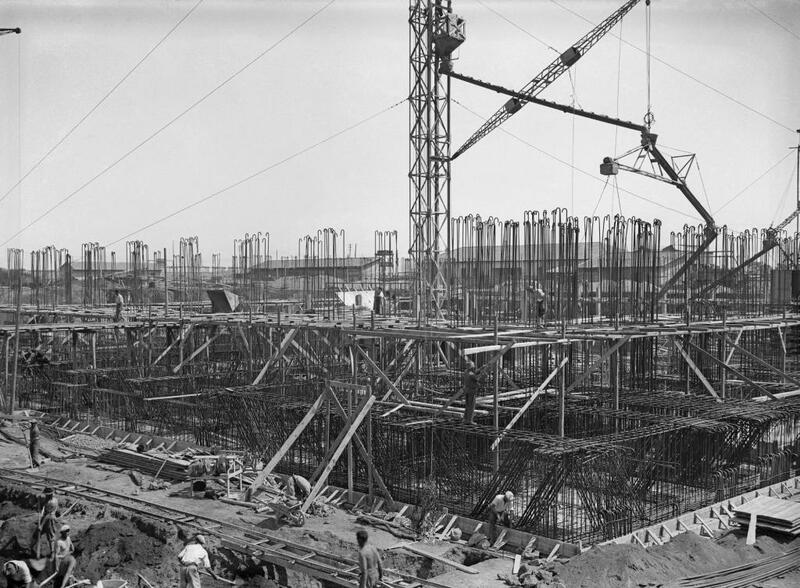 The executive part for this project started on April 26, 1937 and among the planned buildings there was “Il Palazzo dell’Arte” which is where Spazio Novecento is located. Since the first intention of project designers (F.Fariello, S.Muratori e L.Quaroni) it was made to represent a big “agorà” (square) with a clear classic design. The Salone espositivo is characterized with a monumental first floor completely decorated with two pairs of pillars made of marble from Portoro. The Portoro or Marmo di Portovenere is a fine curated type of black marble coming from the Spezia area (nearby Genoa). Works started in the 1939, however, they had to pause the works because of the World War II in 1942. In the 1951, it was instituted Ente Eur, the Palazzo dell’Arte Antica buildings were abandoned and yet to be completed. 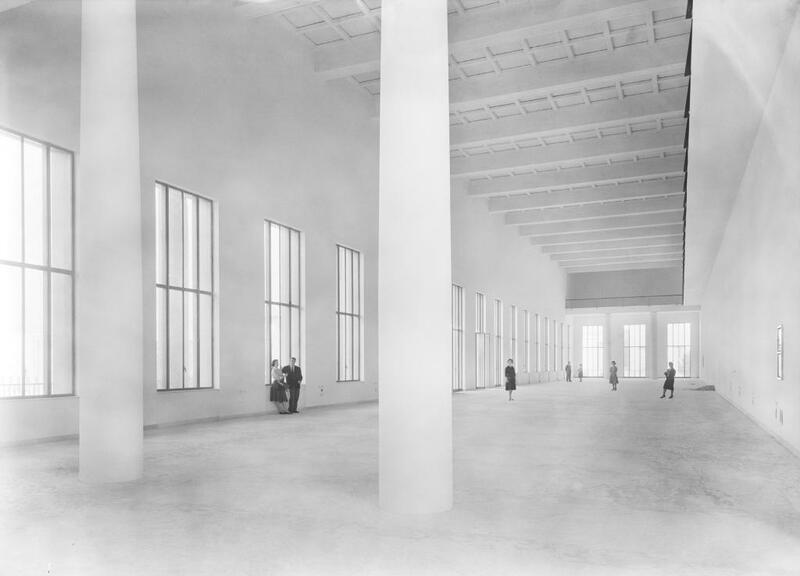 From this moment up until 1957 they started and concluded the works and Ente Eur rented the indoor spaces to various commercial and industrial businesses. 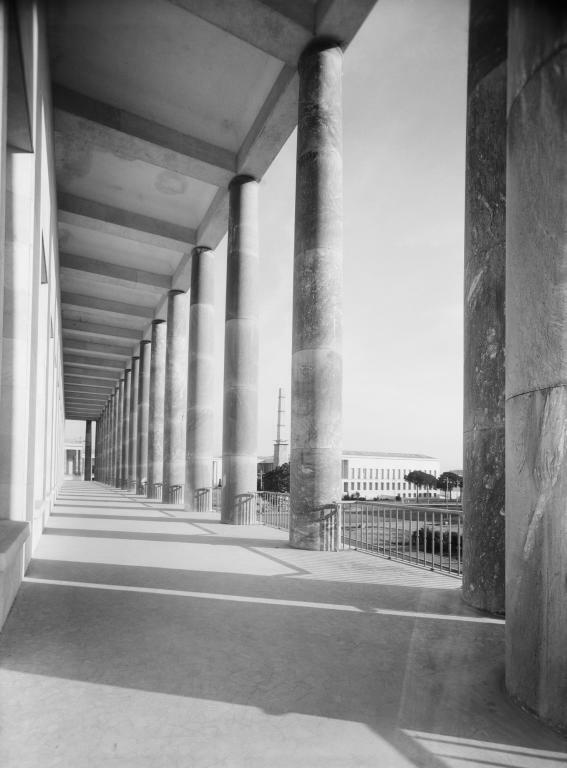 From 1967 to 2000, Ente Eur was transformed into Eur S.p.A. and the indoor spaces were directed by the Latin-Italian Institute. From 2003 on, major renovations were made and in 2006 it was completed. Spazio Novecento officially opened to the public on March 17, 2007;,however, few years back was when it really all began when entrepreneur Stefano Spezia born and raised in EUR fell in love with the most modern and advanced neighborhood in Rome and decided to go directly to EUR S.p.A. to make a location for events possible. The idea was to create a multifunctional space where to host meetings, conferences, exhibitions, fairs, gala dinners, concerts and parties. The idea was presented to an EUR S.p.A. manager, however, it was rejected “Stefano your ideas are not clear. This project is not a restaurant, nor a meeting center, nor a nightclub. We will talk again when you have clearer ideas.” Nonetheless, Stefano Spezia’s thought was different:” my idea was to embrace more than one solution in order to let people involve with various initiatives.” Afterwards, Stefano came back to the EUR S.p.A. headquarters where he found different managers working there. As a matter of fact, the new CEO Mauro Miccio, as soon as he learned the Stefano’s idea, liked it and finally Spazio Novecento became a reality. He was convinced that this idea could be positive for both EUR and the entire city of Rome. Federico Haisberg and Massimo Arlechino were among the very firsts to believe in this project by making important changes within the structure of Spazio Novecento. When thinking about where to have it located, the first proposition was in “Salone delle Fontane” but it was already busy. Alternatively, there was one of the historical palaces facing Piazza Guglielmo Marconi. In the first phase of renovation, the building was the “Palazzo dell’Arte Antica”. Indoors were beautiful, two marble-made pillars located in a long hall made this space called “Salone delle Colonne”. Stefano Spezia knew from the beginning that this was a major project so he decided to call his friend Daniele Aprile. At that time, Daniele was the owner of a well-known place in Rome. Stefano was very happy and knew this project would be a successful one. As a matter of fact, when Daniele Aprile saw for the very first time the hall he said: “Where do I sign?”. From that day, there was a new joint venture called “Happy Days Eventi s.r.l.”. Its name was clearly inspired from the tv show “Happy Days”. Afterwards, there were various meetings held for 1 and a half year. These meetings were so long that many lost faith on this project. However, thanks to the perseverance and enthusiasm, Stefano and Daniele were able to make an agreement for this hall’s property. On December 2006, finally they started the construction works by also acquiring new technological products needed to make this project real. Among many things to develop, there was a necessity to change the building’s name. Thanks to a collaboration with a communications company they started researching for several names. The names’ proposals were eventually so many that Stefano and Daniele decided to have a dinner with friends belonging to different age groups. They all could decide 3 names out of 10 available proposals. Stefano and Daniele decided to aim to a 100% Italian name since its location was inside such a historical area of Rome. Daniele’s idea was the “spazio” (space) considering the fact that the building was built in the ‘900 they decided to unify these two words. Finally, the name was SPAZIO NOVECENTO (space 900).